Grown in Totnes is a project that seeks to increase the range of local food available to the Totnes area. We are very fortunate to have a vibrant High Street with many food shops that stock a vast array of locally grown and processed foods. Local shops support local businesses – local farmers, local bakers, local cleaners, local IT services. This is an example of a circular economy, where the money spent just keeps circulating locally. 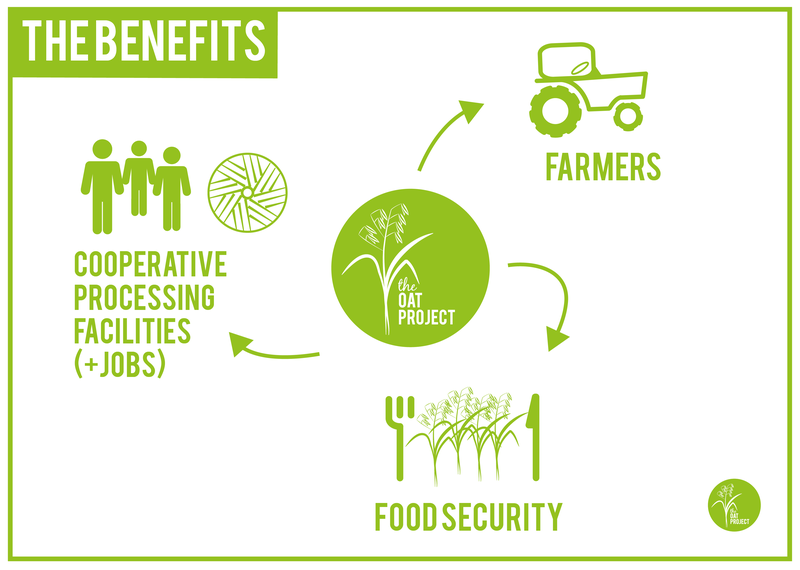 Food is a great example of a commodity that we can provide for ourselves locally, it is one of the few commodities left where this is still the case. Local clothes, where the raw material is grown locally, processed locally and sold locally is possible, particularly using wool, but it is a rare luxury to find such an item. It is possible to use locally sourced building materials, but again this is not the norm and as far as engineered products, electronic goods and packaging go, sourcing local is not an option. Grown in Totnes attempts to set a standard for 'local'. Is it enough that a local restaurant purchases meat from a local butcher? It is certainly a step in the right direction, a local business is being supported, however Grown in Totnes would like to see that butcher sourcing his meat from within 30 miles of the town; following the concept of local through the whole of the chain. This is our definition of 'local'. 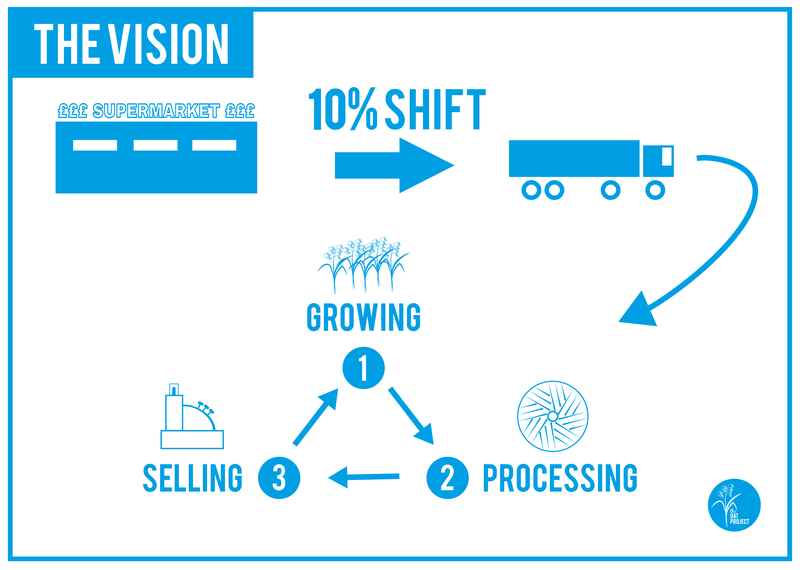 We attempt to bring all of the stages of production, marketing and delivery as far as possible back home. Transition Town Totnes recently carried out a piece of research, called the Economic Blueprint, this found that £20 million was spent in the town's two supermarkets on food and drink annually, in comparison we spend £10 million within the 60+ independent food shops in and around the town. The research showed that local food outlets support 3 times more jobs than supermarkets relative to retail spend, this trend is mirrored down the food chain, with those producers that provide for local markets employing on average 3.4 full-time jobs compared to the regional average of 2.3 per farm. If we could encourage people to just shift 10% of their food spend away from local supermarkets this would bring £2 million pounds in to the local economy. Here at Transition Town Totnes we asked ourselves what does a local diet look like? The answer is that it doesn't look good for your arteries! It is a diet rich in red meat, particularly beef and lamb and rich in dairy. There are some local vegetables and fruit grown in the area, principally by the Riverford co-operative, but this is a relatively low amount. Plus local vegetables and fruit are not available during the months from January to May; this 'hungry gap' is the period when the previous season's vegetable supply has run out and the new season's crops are not yet ready for harvest. 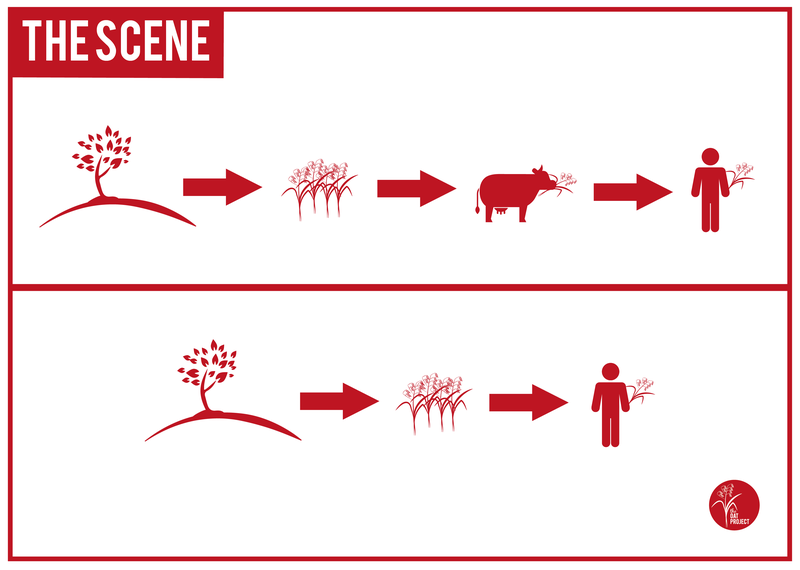 Nearly all of the grains grown in the area are fed to animals for the production of meat and dairy produce. 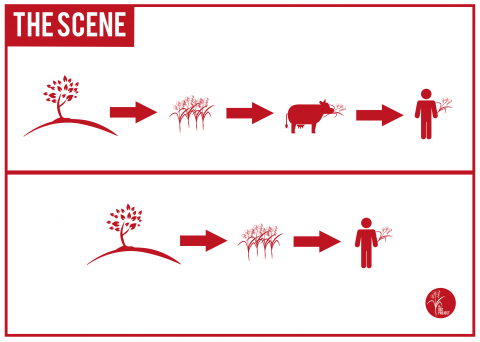 This is not an efficient way to create food to feed humans. Clearly it makes much more sense to use land that is suitable for growing crops on, to grow crops that are suitable for local climatic and geographical conditions for direct human consumption. 'Grown in Totnes' is particularly interested in those staple crops that can be dried and stored, these principally include grains and legumes. Legumes include the many varieties of peas, lentils and beans. We have at least five independent shops in Totnes selling a range of health foods, very few of the dried goods sold in these shops are sourced from the UK and non are sourced from the Southwest. This is the opportunity that 'Grown in Totnes' wishes to seize. 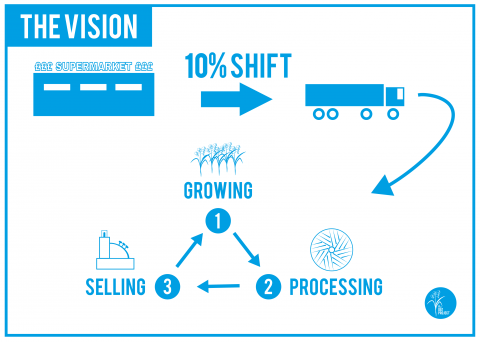 'Grown in Totnes' seeks to work with local farmers to ensure that they are paid a fair price for their crop and create local processing infrastructure to ensure that the crop travels minimal distance before arriving in our shops and on our plates. 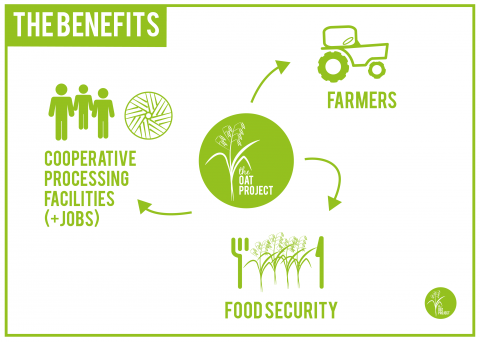 We don't aspire to compete with the efficiencies of scale afforded by the massive, centralised processing plants of the globalised food economy, but instead we wish to provide local skills in the engineering of small, appropriate-scale, processing technologies that are owned and used by the local community through collaboration and cooperation. Only then can we secure our own local food supply, offer full traceability, create a relationship with where our food comes from, work with the land on a sustainable level, know the face of our growers, offer local jobs and skills, keep money circulating in the local economy and create a real sense of pride in our food. 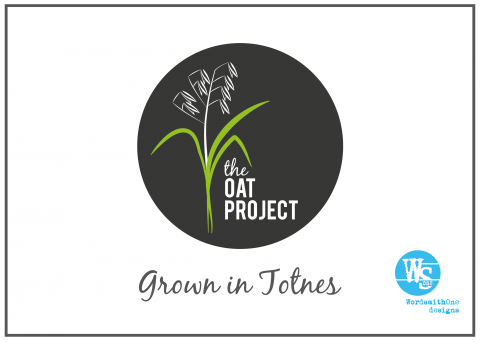 'Grown in Totnes' is starting with oats. Oats are already grown in the Southwest for animal feed. 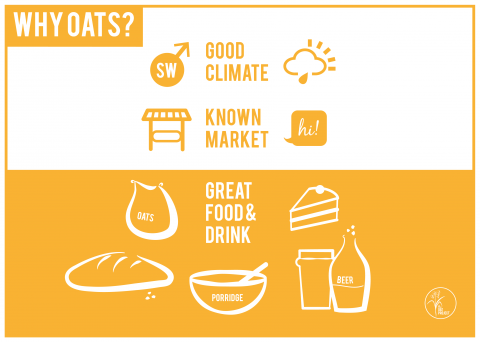 We know that they grow well in the damp, warm climate of the Southwest and we know that oats are consumed in large quantities. 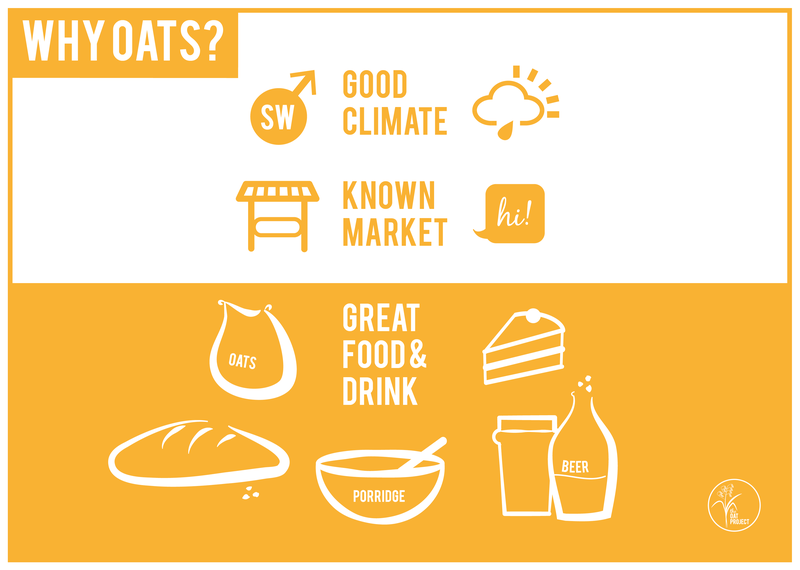 We also know that oats have a much wider range of uses than is commonly realised. Oat flour is great in baked goods, such as scones, cakes and low gluten breads. Oat groats (the whole grain) makes a fantastic sweet, nutty substitute for rice. Oats can also be used in brewing. A local farmer has grown some oats for us this year which will be ready for harvesting in August 2014. We officially launched The Oat Project at Transition Town Totnes' Local Entrepreneur's Forum on May 13th. We requested support from the community and were inundated with offers of help. 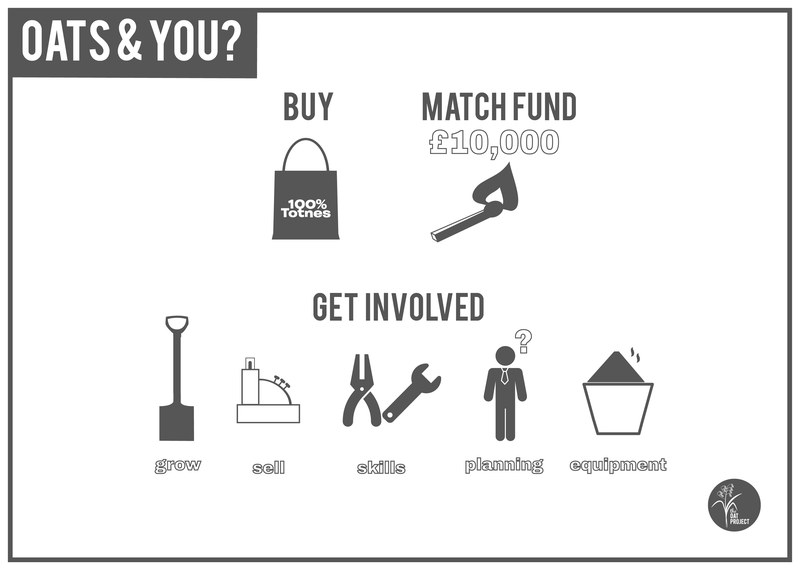 In total 41 people pledged to support us with 54 offers, including £1652 of match funding towards a total of £10,000 that needs to be raised. Pledges of help ranged from hosting events with proceeds going to the campaign, business and financial advice, pledges to buy oats for businesses and private use, assistance with running a social media campaign and offers of sites where oats and other crops could be grown. Most encouraging of all was the overwhelming sense of support and excitement for the project. If anyone would like to find out more or make a pledge to the project please get in touch with holly@transitiontowntotnes.org.